10 kilometres north east of St Helen's is the popular beachside resort of Binalong Bay. The coastal area for about 30 kilometres to the north is known as the Bay of Fires Conservation Area. 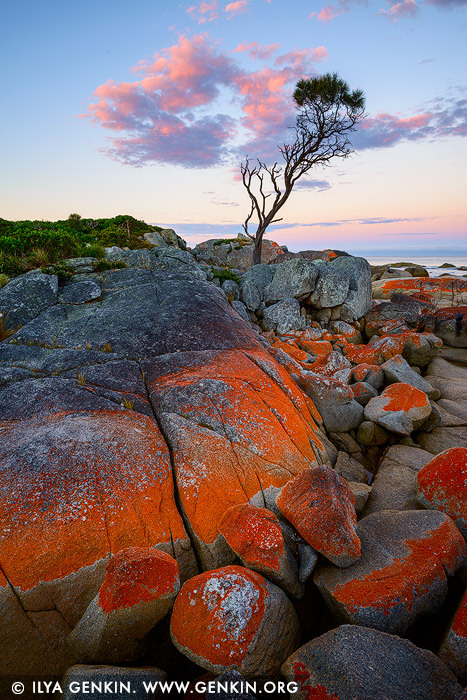 Famous for its crystal-clear waters, white sandy beaches and orange lichen-covered granite boulders, the Bay of Fires is one of Tasmania's most popular conservation reserves. The Bay of Fires conservation area extends along the coast from Binalong Bay in the south to Eddystone Point in the north. This image belongs to the travel and nature stock photo library. This stock photo of Lonely She-Oak at Sunrise is available for licensing for commercial and editorial uses including websites, blogs, books, magazines, brochures and advertising. Restrictions may apply for images which contain third party copyrighted material or sensitive subjects. Photos of artwork are for editorial use only. This image id TAS-BAY-OF-FIRES-0005 of Lonely She-Oak at Sunrise, is copyrighted © by Ilya Genkin. This is not a public domain image.